Being a Denverite, a Coloradoan, a Mile-High Club member (anyone who has lived at this altitude is, after all) I'm not fully familiar with the Bay Area music scene, but I will boast that I know good music when I hear it. 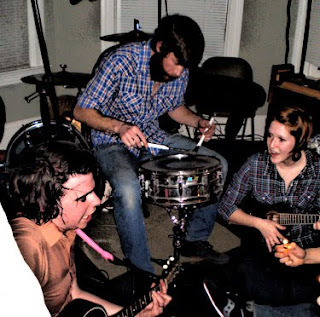 Recently, I linked to three songs by Oakland/San Francisco's The Most Awesome Protagonist, a band led by Mikey O'Connor in various iterations since 2006. The current line-up includes Aaron Goeth (drums/vocals) and Sarah Mammel (vocal and "tiny instruments"). I may not be qualified to speak to the band's growth, or the changes in sound over time, but this lo-fi pseudo-post-punk-indie version sounds full, talented and full of potential. In just three songs, The Most Awesome Protagonist gives us a very clear Clark Kent-Superman act (or if you prefer Peter Parker-Spider-Man) by showing both a raucous, party-centric booze-addled side and a quiet, mournful sincerity that function in appealing and effective contrast. The product of this phone booth mood change is a litany of impressive compositional moments, and some truly exceptional new music. "We Danced In All The Bars" plays up O'Connor's raspy, potent and dour vocalization (he could be a dead ringer for Paul Westerberg) mixed with in a rocking song of reminiscence that overflows with accordion wails in a dirge. Powerful drum work follows, pummeling the lyrics and persistent guitar maintains a driving pace. And then, a beautiful harmony-infused bridge loads on the sincerity and smooths things out for a bit, the perfect bit actually, before the rock returns and blasts through to the final note. "Untimely Death Song" feels upbeat, but the lyrics (as the title might betray) are quite the opposite, as the words cry for help and compassion in a world of abandonment. O'Connor's wailing serves the chorus especially well, as he sounds genuinely lost, alone and helpless. The drum work keeps perfect pace, dropping back when the drama is necessary, and stellar backing vocals fill in any blanks. Any song that ends with the cry, "Don't let me die here all alone" and then fades to silence leaves me with a questions. What does that silence mean? Does it mean loneliness? Does it mean death? I might be reading too far in, but this is my favorite song of the three because of the sincerity, and because the song stops short of melodrama or droning on to the point of irony. It's the perfect amount of fear and death, and the silence afterward is essentially permanent. "Try Another Day" is the Clark Kent track, loaded with ukulele and pristine harmonies. It's a song about finding the perfect person, and losing them, and looking again. It's the perfect outsider looking in song, for when we all feel paralyzed by the beauty right in front of us. And the song itself is so beautiful that it feels complete. It's not some singer-songwriter, whiskey soaked mumbler of a song, and that makes the repeat, sweet sentiments extremely palatable. The melodica solo at the end is a particularly graceful touch. What I love about music is that it's part of our collective consciousness. We all hear it all the time and we all have a certain capacity to create. When a small group of songs like this (Can I call it a three's company of songs? I probably shouldn't.) shows so much diversity and complexity, while also showcasing a bands greatest strengths I think that's a pretty solid indicator that there are great things to come. Check out The Most Awesome Protagonist. This is a band to root for. We need new heroes.